“Close the nine gates of the body and rest in the body’s inner space. How is it possible to free a blocked nasal passage, or get rid of a headache, by concentrating on a certain point in the body? Can you remove the butterflies in your stomach that you get under stress, with the help of willpower and by using a certain mudra or ‘attitude’? This area of yoga is called attitudes and locks, in Sanskrit Mudra and Bandha. They go deeper than the more physically orientated poses – which you should master in order to benefit fully from the Mudras and Bandhas. 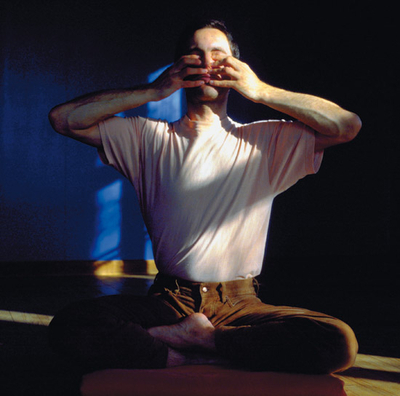 Through the yogic breathing methods, you become conscious of your energy and get the possibility to influence it. With attitudes and locks, you go further. They help you to re-establish the true form of your energy field in and around the body, thus removing excess (hypertonic) or lack of (hypotonic) energy where needed. The energy, which was bound in these tensions, are freed, and the optimal energy level of the body is restored. This influences your frame of mind and your activity. There are many mudras, but only three bandhas. In Yoni Mudra, ‘to be as in the Womb’, which you see in the picture, you close the ‘nine gates’ of the body and experience a state of rest – at one with your body. This effect on your physical state will help lead the way to calmness of the mind. Yoga, and with it, meditation, touches you more deeply than any other known system. It does so without haste, in that it follows the natural laws of your body and mind. When you practice yoga on a daily basis, you are truly independent of external stimulants, pills or fitness equipment. You only need yourself to practice yoga – and body and mind, are given a chance to harmonise themselves.